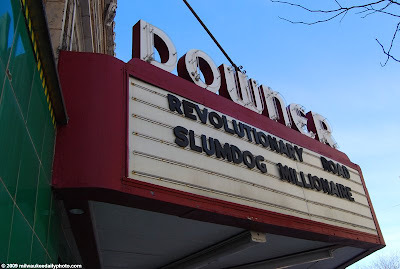 One of my favorite movie theatres, the Downer (found on the street of the same name) has been showing unique films as long as I can remember. I've seen Bizet's "Carmen" and The Talking Heads' "Stop Making Sense" there, and they're both among my most memorable movie-going experiences. Is the Uptown Theatre still around? When I lived in Milwaukee back in the late 70s I worked for WLPX radio and we did midnight movies at the Uptown (Rocky Horror Pictures Show and stuff like that). And I used to go to the Oriental Theatre too... is that still around? The Oriental is still there... I had it in an earlier post. Some googling shows that the Uptown was demolished in 2001 for a police station. WLPX... I should send you a picture of my recently rediscovered Rock & Roll Air Force card!